Mark Moseley and myself went squidding at Point Cook. The fishing was hot bagging out of after 3 hours. A rapid start with the first squid being caught in 20 seconds which inked me all over the face. I didn’t have time to clean my face before my rod was on. The squid jigs that produced very well were Fish Candy 3 gram Black with white stripes and the Dark Red. 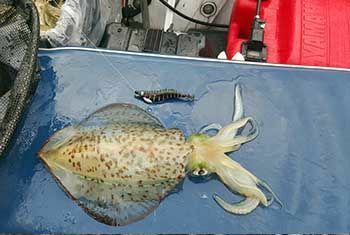 2 really good size squid caught on the day. My new PB which was a squid well over 70cm with the hood measuring 30 cm and Mark caught a squid over 65cm and the hood measuring 27cm. After we bagged out of squid we had a small flathead drifting session catching 3 flathead over 40 cm and many small which were released.